In a ranking issued on the best international high school teams that participated at North American MUN conferences, The Lyceum School has featured in the Top 10 ranking, being the only team from Pakistan to do so. The team participated at Harvard’s MUN conference in Boston in January and won 9 awards out of 16 students. The ranking was diverse, taking in teams from as far apart places as Venezuela and the United Kingdom. How many knew that LUMS, a university in Lahore, has won the Best Small Delegation award for 5 consecutive years at Harvard WorldMUN (last year, they narrowly lost to Yale)? Or that out of the 40 university students from Pakistan that participated at WorldMUN last year, eleven bagged the Outstanding Diplomacy award? In a similar vein, high school students have also done remarkably at Model UN, against all odds. 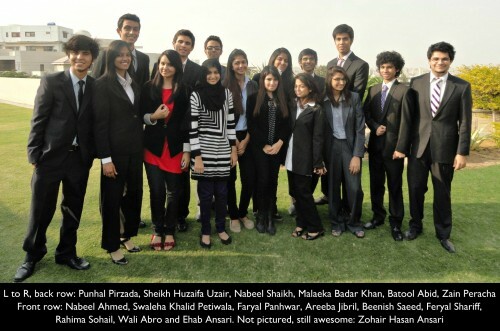 Thus begins the story of a Pakistani high school delegation and its journey to HarvardMUN 2012. At HarvardMUN 2012, The Lyceum School represented France in twelve committees: DISEC, ECOFIN, SOCHUM, SPECPOL and Legal; alongside the European Union, World Trade Organization, World Health Organization, Futuristic General Assembly, the Historical League of Nations, the United Nations Special Summit on Peacekeeping, and the United Nations Security Council.